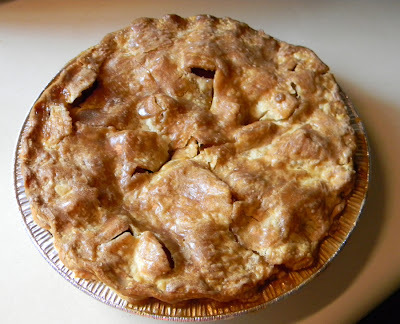 Daily Dzynmkr: Apple pie, anyone? Recently, I bought a 5 pound bag of apples. The favorite around this household is the Granny Smith variety. The apples weren't being eaten fast enough and I hate to see good food go bad. So, after watching too many Food Network shows, I decided to make my first attempt at baking an apple pie. I filled the crust with apples and worked on my syrup mixture. I used this recipe from Allrecipes.com and made a few changes after reading the reviews. I added 1 teaspoon of cinnamon, a dash of nutmeg, 1 tablespoon of vanilla and 1 tablespoon of cornstarch to the syrup mixture. Then, I poured the mixture over the apples (leaving a tiny bit to brush on top). This is when I realized I still had to put on a top crust and the nice folds I made earlier would be covered up. Sigh. I came back to the online tutorial - just to find out that I should have waited to do the folds. The idea with a TWO crust pie is to trim both crusts together, tuck under the edges and THEN do the folds! Oh well, guess I'll try that on the next one. : ) The only thing I could do was trim the top crust, tuck it under the best I could and try to follow the folds that lay underneath. Above is the final product - the "fruits" of my labor. I still haven't tried a piece yet, so I don't know how it turned out. (I know what you're thinking...the pie is still sitting there?). I'm going to try and have a piece today. I'll let you know what I think after the taste test. Until next time - Happy Cooking and enjoy the unexpected things that happen along the way. The pie turned out surprisingly well for my first attempt. Great flavor - just not great to look at!